These are possibly down to Zdaemon issues. In singleplayer these bugs are not present. 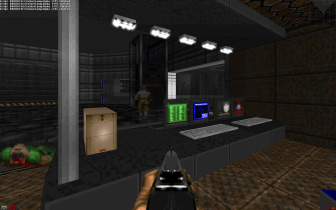 -Tweaked generic doors on every map. -Fixed lifts, it is no longer possible to render them unusable. -Boss teleportation check on MAP06. It is no longer possible to block the teleport destinations. 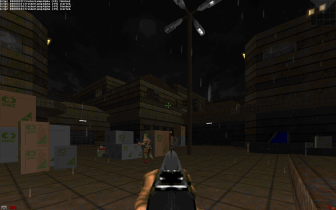 -It was possible to go through the laser fence on MAP05 with "brute force" when more players are present. Fixed. -Changed MAP01 storage alarm. It was causing too much bandwith in online mode. -Added impassable lines to the metro on MAP03, so it is no longer possible to glitch in the 32 wide areas. -Fixed MAP02 lift. For real this time. 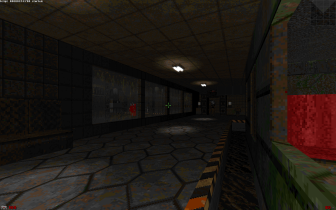 -Minor changes and fixes on MAP03. -Made informative hudmessages display for all players. -Made the plazma demon's projectile smaller. -Changed revenant attack: it fires two homing rockets instead of one fireball. Total damage remains the same. -Made the Annihilator's rocket a bit weaker. or "set tehbase_norain 0" to enable (requires map restart to take effect). the spot becomes inactive. This is done to keep bandwidth usage as low as possible. Worst case scenario is around 80KB/sec/player, if every rain spot is active (there is a player inside the range for every rain spot). Average bandwidth should be much lower than that. 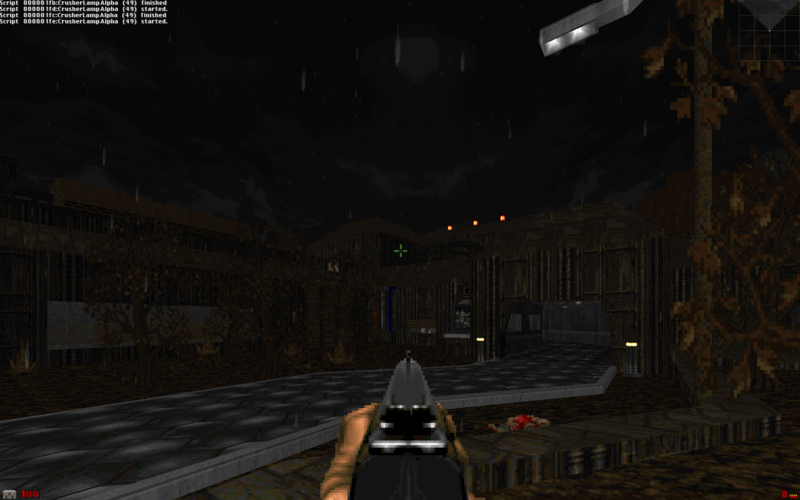 -All bandwidth intensive decorative map effects were given sight checks and distance checks similar to rain's. These checks have been extended to ignore bots, only human players can pass them. This means the effects will only consume bandwidth when they are actually seen or heard by a player. -Fixed MAP02 barrel crusher machinery, and made it compatible with new barrel height. -MAP04 minor fixes and adjustments. -MAP04 Pvt. Willis event could be skipped. Fixed. -Moved keys on MAP04 and MAP05 to more noticeable spots. -Minor texture fixes on MAP06. -MAP01 backup generator monster ambush was not spawning monsters correctly. -Fixed issues with distance & sight checking. Rain and SFX should work as intended now. -Fixed crash caused by revenant's rocket in Zdaemon 1.10b02. This is a workaround until new Zdaemon is released with proper fix. One question, will this lagg MORE than your cs_ctf_rldd map01? Anyway, can't wait to see this on ZD..
No, it's not laggy as CSCTF_RLD_beta1. Because CSCTF map01 has a huge field. And this wad doesn't have huge fields. This looks pretty damn gd. BUT WILL THE GAMEPLAY BE AS GD AT THE LOOKS. When i finished with MAP01 i upload more Screenshots about the 100% Complete map! Don't worry about gameplay, I'll keep an eye out for it. We all know that Gameplay > Detail. As far as I see and know how body guard works this will be a good stuff I promise. I uploaded a beta for testing. This wad is working only Singleplayer with 1.08.07, and you can play online when 1.09 is out. This is not a monsterspam Cooperative. There are 1 Map in the Beta version. Nice, this map is of high quality. I like the progression and your base/industrial design. The theme seems kind of strange since you are using such a large variety of textures, though. One room will be gray and another will be covered in white and brown STARTAN and another will use some gritty brick textures. I also suggest that you don't use up all of your new monsters on the first level. Of course, I guess I just assumed this was map01 but I suppose it could be map09 just as well :^P. It would be a shame if you pulled all of these great demons out of your bag on the very first level instead of introducing them gradually. Other than that everything is cool, but I had to unfortunately stop playing after I found the yellow key due to time constraints. Last suggestion: that arch-vile lift seems to move very slowly. It operates nicely but slows the gameplay down for what feels like ten or fifteen seconds. Maybe speed it up a little bit? Hay this is very nice looking! I'd disagree with Cupboard about the texturing, I feel it gives it more of a sense of its own identity and stops it looking like 1001 other Co-ops. Hmm... about that Co-op thing... I wouldn't want to with more than 2 players I think. Some areas are spacious enough but you have a lot of tight regions and 64 unit wide hallways which would piss me off in multiplayer. I enjoyed some of the new baddies, always wanted to see demons like that! The zombie marine and the brown barons were a bit crap though. Didn't see the point in either of them. The archvile variant seemed especially cool but didn't stick around long enough. Maybe a couple of those would work better for the ending instead of mixing them up with archviles? looks pretty good, I look forward to seeing a full version of this. also, what's this thing I get sometimes when I run out of ammo on the bfg? the graphic is up in the corner, and it uses ammo but nothing in the ammo indicator goes down. It looks like it's shooting some kind of fireball or rocket. And the project is not dead! Im working on map 02 right now. I hope the Doom players will be enjoy it. 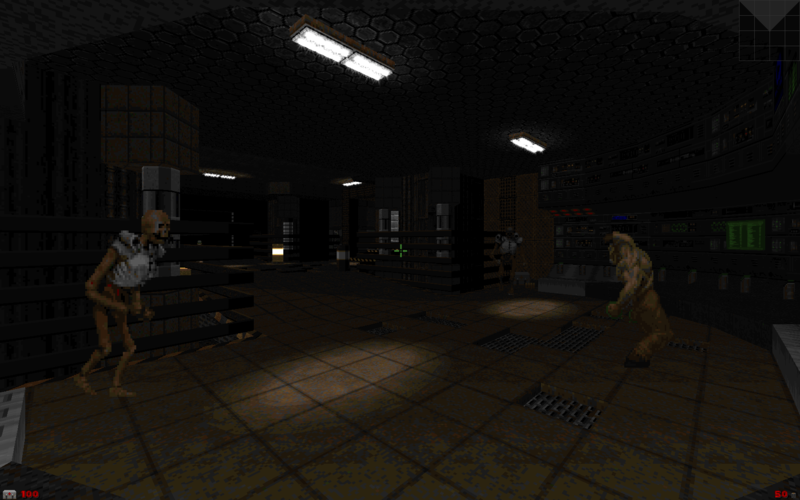 This will be the first 1.09 Cooperative mod with a lot of awesome zdoom features. The maps contains dark secrets from the hell! 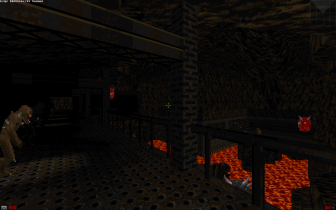 Oh noice, Map02 is finally in production, eh? 1.08.09 might even offer enough of the features you need for this project anyway. No need to hold off for 1.09. I think the full complete wad will contains 5 big maps and when the players want and i have time to make maps i will make more maps for the wad. Hey Body-Guard, this is quite offtopic, but have you seen that counter-strike_ffa on a server? Rather than load your guns in on the server, the map pack (stupidly) incorporates your guns in it as extra bloat. Was just wondering if that was done with permission? I saw that server but I couldn't join because the admin loaded zvox4 twice(I suppose that was bundled with that wad too) and I didn't bother testing the wad in singleplayer despite my bad feelings about it. To the point, there was no permission given. Thanks for warning us. I recorded a vid about TEH BASE a few days ago, here you can see some nice machinery! Soon we will publicate the TEH BASE first stable public version with 6 maps (from 01-06). If the most players will play it we will make other maps for this project. 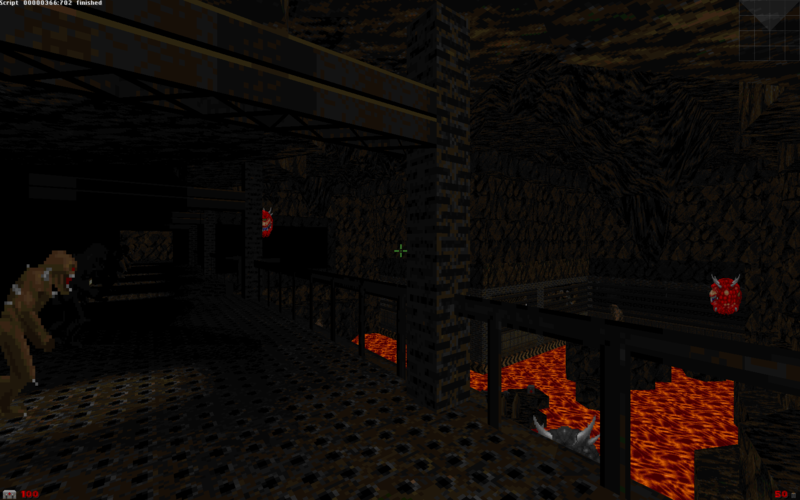 Here is a screenshot about the TEH BASE map02. THIS PROJECT IS NOT DEAD! STILL ALIVE!!!!! The machinery is very cool. OoOo man this wad looks sooo legit I CANT wait 'till is released I'm really hoping is SOON so I can play it!! Great job! That video is such a tease! This looks great, I can not wait.